Brees is the son of my best field trial dog, Merganser's Classic Matlock QA2 and a grand-son of another of my favorite dogs, Int CH Merganser's Abram Tank MH, WC. I purchased Brees when he was 10 months old. Due to family circumstances, Brees was returned to his breeder. Debi Bonomini asked me if I could sell him for her. I took one look at Brees and said, "He is mine." 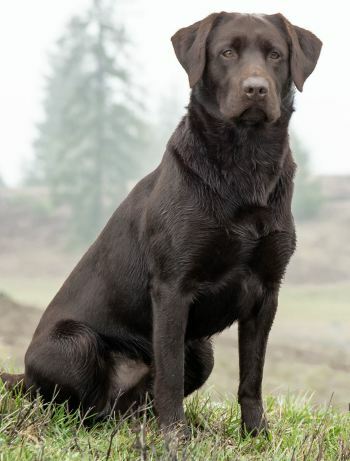 Brees has a very dark chocolate coat, broad head, otter tail, and stocky build….just like Matlock and Abe. Brees has several mannerisms of both Matlock and Abe. When this happens, I feel like I have Matlcok or Abe back. This is a rare gift in life and sometimes brings a tear to my eye. But the longer I have Brees, the more he becomes his own vibrant personality. I am having so much fun training this dog. He has such a strong prey drive and desire to train. Brees is fast, extremely agile, and a strong swimmer. We are behind in training due to starting at an older age. I plan on running Brees in hunt tests and field trials this year.